Wizards Of The Coast, the company responsible for Magic: The Gathering, is taking a time walk through the game’s 23-year history. June 10 will see the release of Eternal Masters, a new set that compiles and re-releases nearly 250 cards from throughout Magic’s lifetime, and The A.V. Club has been provided with two exclusive preview cards to show off. Formats for Magic play have mutated more than a Ninja Turtle. Standard allows cards only from the most recent sets. Modern pulls from the last 10 years. And then there’s Legacy, an incredibly fun, if infuriating and complex, format that’s made up of pretty much every card ever printed—even the really sucky ones. The power level of cards in Legacy is high, and thus Wizards has a hard time supporting new players who want to get in on old-timey tournaments. Putting a reprint of an uber-powerful old card in a normal set would tip the scale hard. (Imagine playing poker, and all of a sudden there’s an Ace Plus™. ) 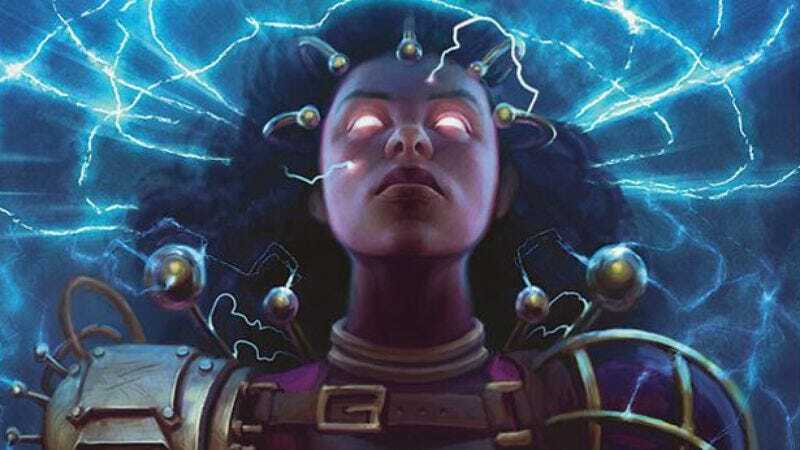 Eternal Masters is designed to be drafted—where players compete by building a deck on the fly—but it also allows anyone who wants to start playing those old-school formats access to some very rare and dominant cards for their super-powered deck. Brainstorm might not be the rarest or most valuable, but it is by far the best card in Legacy. It allows for players to “stack the deck,” so to speak, and those who doubt its power will soon get the idea after playing against an opponent who constantly reaps its benefits. Here’s a fun one. Like a certain spell? Wanna cast it over and over again with essentially no downside? Do you enjoy destroying other people’s fun? Then here’s a card for you.